This Sweet Potato Curry Soup is spicy, warming and delicious. It’s been inspired by a soup I have been eating at Lavinia lately. Lavinia is close to where I teach my yoga classes and I go there in between classes for my break. I enjoyed the soup so much that I tried to recreate my own version at home and I really love how it turned out. I eat this spicy Sweet Potato Curry Soup for lunch or as a light meal in the evening. It’s really great on a cold day as it warms you up instantly and it’s quite a filling and satisfying meal on its own. It’s a close game between this soup and my favourite soup in the world. 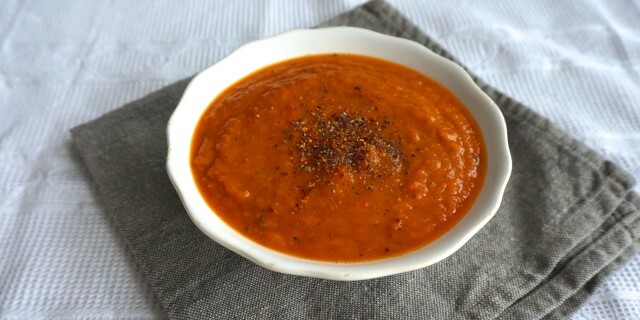 If you enjoy my Red Lentil Coconut Soup, you’ll love this one too! In a large pot heat up olive oil and fry the garlic, shallots and chili for 2-3 minutes. Add the sweet potato, carrots and curry powder, chili powder and cinnamon. Fry for 2 more minutes. Then add all other other vegetables and vegetable stock. Bring the stock up to a boil, reduce heat and allow to simmer for 30 minutes or until the vegetables are soft. Add more stock if necessary. When the soup is ready, remove from heat. Use a hand-held blender to create a smooth and thick texture. Season with freshly ground black pepper and sea salt and drizzle some olive oil on top. Serve right away. ⇐ Is coffee healthy or not?